Aside from All Quiet On the Western Front, World War I doesn't have as many memorable films as the Second World War does, such as those ranging from The Best Years of Our Lives to Mrs. Miniver to They Were Expendable to Saving Private Ryan. Well, perhaps I am too quick to dismiss: there is Wings, and Paths of Glory, Grand Illusion, and Joyeux Noel, and technically Lawrence of Arabia is a World War I film, but it dealt with the Ottoman Turkish side which usually isn't associated with WWI. For whatever reason the 'war to end all wars', despite some truly horrifying carnage, gets in my view short-changed in the cinema department. War Horse doesn't rectify our lack of a collective memory of World War I, and it comes close to being less about the war itself than a remarkably tender story about The Horse & His Boy to coin a title. Stephen Spielberg, no stranger to sentimental film or war movies, combines the two in a strong, though a bit too long, film. Young Alfie (Jeremy Irvine) loves the horse his father has bought. When one says 'love', one means 'total, absolute, unrequited passion' for this beast. Alfred is totally devoted to his horse, and the horse, named Joey, appears to be totally devoted him him. Which is why his father Ted's (Peter Mullan) selling Joey to the Army to pay for rent and for the war effort tears at Alfie. Alfie's mum Rose (Emily Watson) doesn't care all that for the horse, but knows what the horse means to Alfred, so she can only stand by and do the best she can. 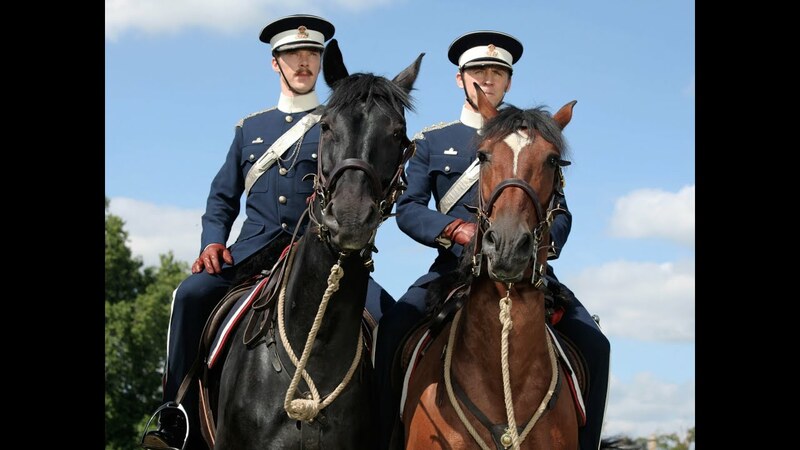 Joey's second owner is Captain Nicholls (Tom Hiddleston), who sees in Joey a noble steed and will watch over him while in the front. However, that goes by the wayside in the waste land pretty quick, as the good Captain falls after a failed cavalry charge by Major Stewart (Benedict Cumberbatch). Now Joey is in the hands of the Germans, but the boys who tend to him, Gunther (David Kross) and Michael (Leonard Carow) see the goodness within Joey. Gunther deserts, taking his underage brother with him, along with Joey and another horse he's bonded with while with the British. The German brothers make a quick and rather horrifying exit, to make room for adorable French girl Emilie (Celine Buckens) and her Grandfather (Niels Arestrup). Again, little bonding time entre fille et cheval before those nasty Germans turn up again and take our loving horse couple away to do brutal work. Joey's horse friend finally succumbs to the brutality of war, but Joey is quietly persistent. Good thing too, as having endured four years of this, now Alfie is in the trenches, still with his beloved memories of his beloved horse: even holding on to a sketch the late Captain sent him four years earlier. In a bit of daring-do, Joey manages to escape, rushing through No-Man's Land during a fierce night battle but getting tangled in the barbed wire. 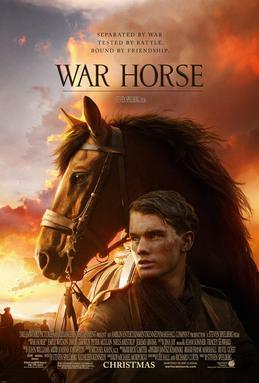 It takes the joint efforts of an English and German soldier, working in tandem, to free him, and Joey is led back to the British lines, where 'the miraculous horse' is recognized by Alfie even though he has been temporarily blinded in a gas attack. The Horse and His Boy are finally reunited, and despite a near-second loss when the French Grandfather comes, Alfred and Joey ride on to the lush countryside and peace. If War Horse is anything, it is lush. The opening has lush cinematography courtesy of Janusz Kaminski, lush music courtesy of John Williams and even lush actors courtesy of newcomer Irvine. The beauty of War Horse runs through the film: the battle sequences, particularly when Joey flees into the night, are both beautiful and terrifying, and the film ends with the returning war heroes bathed in sepia. If War Horse is another thing, it is totally sentimental and unabashedly so. There are several moments of this with Lee Hall and Richard Curtis' screenplay (based on Michael Morpurgo's novel and the stage adaptation). We can see this early in the first act, whenever we have the interaction between Joey and Alfie: Williams' stirring music and Irvine's wide-eyed performance of this young lad becoming totally devoted to this horse heighten this dip into emotional heart-tugging. There really is nothing wrong with that, although all these calls to become attached to any of the characters sometimes doesn't have a payoff. If one dwelt on it, one would think Joey was a curse to anyone who isn't Alfred, even the most innocent party. Joey appears to be some sort of harbinger of death to those he comes in contact with; the ends of the German boys, while not graphic, appeared to be particularly cruel and only ended up padding the two hour and forty-six minute running time. In fact, War Horse could have really skipped over most if not all of the second act with the German youths and the French grandfather and child without stopping the overall flow of the film itself. As a side note, it almost seems unfair to introduce us to people only to leave us in the dark. It can't be a good sign when you do start to wonder what ended up happening to Major Stewart. However, War Horse has some wonderful things beyond the sheer lush visuals. Another side note: while watching the film, I couldn't help thinking that there was this vague How Green Was My Valley motif to it, almost to where War Horse could easily have been made in the late 1930's. There are some wonderful performances within it. First, as already mentioned is Irvine, who has this wonderful, almost innocent look to him even during the battle scenes, where with just his lush and beautiful eyes he told you just how much he felt for Joey. Another great albeit brief performance was from Hiddleston (who made such a great impression in both Thor and Midnight in Paris) as the Captain who loved Joey almost as much as Alfred. Emily Watson should be commended for being a strong yet loving wife and mother. Honestly, I could have done without the precious grandfather/daughter relationship (a bit too precious), and while I don't hold anything against Kross, I did spend all the time he was on screen wondering if he was the kid schtupping Kate Winslet in The Reader. Spielberg brings some wonderful and touching, even funny moments to War Horse. One of the best scenes is when Joey is tangled in the wire, and the British and German soldier go get him. Here, we see these two combatants as the men they really are, and we can see the common humanity within even these two 'enemies'. Here, we come close to the greatness of something like All Quiet on the Western Front. There are hints not only of All Quiet and How Green, but also Lassie Come Home and even The Little Princess; whether one thinks it is very convenient that Alfie is blind just when Joey is brought to the army hospital or whether it mirrors a scene where Shirley Temple's father is unwittingly brought to live next door to the school she is at I leave up to the audience. I'd argue War Horse is too long for the story it is telling; we could have trimmed the first act what with David Thewlis' evil landlord. Most of the second act, in particular the German and French characters we barely got to know could also have been trimmed considerably, even cut altogether. We could have spent more time with the Captain enduring the hell of trench warfare and making his exit more heartbreaking. One should remember it is 40 minutes before we get to the war: 40 minutes of Alfie and Joey and their green valley. However, as a whole War Horse moves audiences; there were quite a few tears and sniffles at the screening I attended. Unfortunately, there were also a few snores, and one woman I overheard said they should have gone with The Dragon Lady. I figured she meant The Girl With the Dragon Tattoo. War Horse will test one's patience, but the end result, while not perfect, is a lush, sentimental film, with some wonderful performances from Watson, Hiddleston, and especially Irvine: the term 'star-making' seems apt. In the end, his friend Joey will stir emotions, and that's what War Horse intends, so it meets it goal and races to a winner's circle.